Today (June 11th, 2014): British Airways Club World (Business Class) Boeing 747-400 from London to San Francisco (upper cabin). 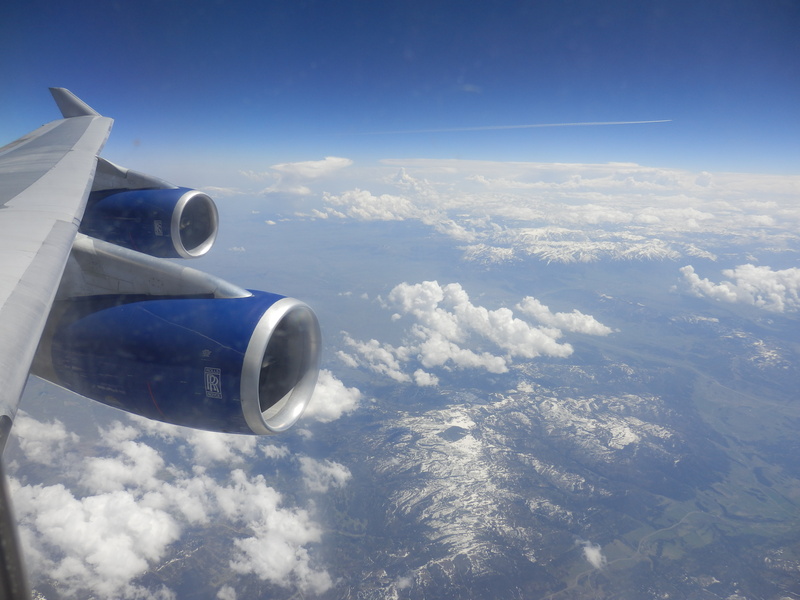 On May 22nd 2014, I flew Business Class in the upper cabin of a British Airways (BA) Boeing 747-400 from London (LHR) to San Francisco (SFO). BA offers a pretty solid and identical business class product on all of its long-haul fleet (with the exception of its aging Boeing 767 fleet), although the new Airbus A380 (read my trip report onboard a BA A380 here) and Dreamliner planes feature an updated version of the Business Class product. But while BA’s Business Class (dubbed Club World) raised the bar for Business Class worldwide a decade ago with the introduction of the first fully lie-flat seat, it is now outclassed by some of its competitors, especially the Middle East and Asian carriers. Nevertheless, the overall experience was very good (with a British touch) and it remains one of the best Business Class products on the Transantlantic routes (although these days, I prefer the Business Class product onboard American Airlines’ new Boeing 777-300ER; read my review here). I am a huge fan of BA, especially its crew. While being a frequent flyer (One World Emerald + Miles & More Silver status), I am still a little uneasy and anxious when flying. What really helps is that BA not only has an inflight video to ease nervous flyers (trailer), but also that their professional and friendly crew always uses the exact same routine for passenger communications. For example, the flight crew always talks over the intercom to the passengers before take-off and 40 minutes before arrival (no matter how short the duration of the flight is), and the cabin crew always addresses the passengers following their flight crew colleagues. Somehow, this predictable routine (often lacking with other airlines) makes me feel a lot more comfortable. In addition, I once experienced a bad delay with BA (out of their control), but they handled it so well and professional, that they earned my loyalty as a consequence (I shifted from Star Alliance to One World in the months thereafter). British Airways features in my top 10 lists of the best airlines for longhaul Business Class and the world’s best airline lounges. Heathrow Terminal 5 is one of my favorite airport terminals in the world. It is a multi-floor lounge complex that resembles a shopping mall, and it is the heart of BA’ activities at Heathrow. Within the Terminal 5 complex, BA has one Galleries Lounge for business class passengers and/or Oneworld Sapphire members, a First lounge for Oneworld Emerald members, and just to confuse things, they also have the Concorde Room, for First class passengers, with hotel-style rooms featuring beds and en suite bathrooms, plus restaurant-style dining. BA’s lounges at Heathrow (as anywhere else in the world) are a huge step up from most airline lounges (and they are definitely one of the best business class lounges in Europe). Both the Galleries and First lounges are very spacious, embrace the daylight, and have a lot of food on display: a fresh soup bar, hot and cold entrees, lots of snacks, full coffee stations with all sorts of cappucino and lattes, and a very broad selection of wines, beers and spirits. Having said that, the difference between the Galleries Business and First lounge is only marginal, with a wider selection of food at the First Lounge (including a menu offering salads and burgers). The various BA lounges at Terminal 5 share an Elemis Travel Spa, which is pretty awesome: while the complimentary treatments are quick, like 15 minutes, they are top shelf, plus it is something else to do to break up the trip. I loved it. And it doesn’t matter which lounge you are in, you have access. From the lounge, it was a short trip to Terminal 5C where our 747-400 (still the Queen of the skies) was ready for boarding. The innovative “Ying/Yang” seat plan is unique to British Airways: window and middle seats face backwards, while aisle seats face forwards. Because of this unique concept, you may have to jump over other passenger’s feet to reach the aisle when seated in a backward facing seat. On the lower deck of the 747, the seats have a classic 2-4-2 layout (similar to what is found on BA’s 777 fleet). On the upper deck, there are only 20 seats with a 2-2 layout, so there is more space for fewer passengers and it almost feels like flying in your own private cabin. I like the privacy and quiet atmosphere of BA’s 747 upper deck so much that I still prefer it over the more flashy business class products of other carriers’ single-decked planes. I hope that BA will keep the old bird flying for many more years to come. For a seat map of the BA 747, click here. Note that there are 2 seating versions of the BA 747, but the layout on the upper deck is similar in both versions. Regardless of the seat plan, all Club World seats offer the same degree of comfort, with a seat pitch of 73 inches (193 cm) and a seat cushion width of 20 inches (50 cm). The angle of maximum seat recline is 180 degrees, and the overall length of seat when fully reclined (and when tilting the separate foot rest) is a 6ft (183cm) lie flat-bed. Next to the seat, you can find the seat controls, the entertainment controls, a reading light and a power port. The private entertainment screen is rather small (9 inches or 22 cm) and swings out from the side of the private cabin suite. It also tilts up and down, so watching the screen from the near or fully flat-bed position is perfectly possible. How to choose the best BA business class seats ? For a seat map of the BA 747, click here. Upper deck atmosphere is far superior to that of lower deck, so choose an upper deck seat. Window seats are more private (and in addition, have more storage space on the upper deck). The “honeymoon” center seats on the lower deck, where you’re basically seated as close to the person next to you as you would be in economy, are great if you’re traveling with someone you want to be that close to, though it would be downright awkward when you end up next to a stranger in that configuration. Seats 62A, 62K and 64A on the upper deck are the single best seats since they are the only window seats in the 747 where you will not have to jump over the feet of other passengers (direct aisle access) and they offer more leg room. 64A (my seat for the flight) also has direct aisle access and more leg room, but it is located next to the lavatories, so this may bother some because of the extra noise (it did not bother me, but it was a day flight after all). Each seat comes with a thin blanket, a small (and not-so-comfortable) pillow, and an amenity kit. The latter is a drawstring bag (one for men and one for women) that is designed to double up as a shoe or lingerie and underwear bag and includes Elemis products to refresh, revive and rehydrate, created in travel sizes exclusively for BA customers. The men’s bag includes Skin Soothe Shave Gel (7ml), a Pro-Collagen Marine Cream (5ml) and an Ultra-conditioning Lip Balm made from Beeswax (4g), along with a Razor, socks, toothbrush, toothpaste and a pen. The women’s bag includes a Limited Edition Pro-Collagen Marine Cream (7ml), soothing apricot facial wipe, the Ultra-Conditioning Lip Balm (4g) and some Pro-Collagen Hand & Nail Cream (5ml) along with socks, toothbrush, toothpaste and pen. Upon boarding, I was offered the choice between a glass of water, orange juice or champagne. And after reaching cruising altitude, I received a refreshing hot towel (disappointing texture and smell though). I was also served a sprite (with ice and lemon) and a small bag containing an assortment of cold nuts. Soon thereafter, lunch was offered, all served on a single tray. British Airways Business Class food can be a hit and a miss, and this time the food was pretty good and acceptable for transatlantic Business Class. As a starter, I choose the tiger prawns Bois Boudran with Pepquino and crème fraîche. Quite delicious! As an entrée, I had the roasted-corn fed chicken with pea and broad bean fricassée, sweet potato mash, and Port wine jus. I kind of liked it (maybe a little too much jus). For dessert, I choose the peach Melba Délice delice with raspberry confit. But what I received was not a peach, but a lemon and mascarpone tart with raspberry compote. It tasted good nevertheless. 90 minutes prior to landing, all Business Class passengers were served afternoon tea, snacks (a selection of sandwiches featuring tomato and herb chicken with basil pesto, prawns with creamy mayonnaise, and Wensleydale cheese) and sweets (buttermilk or fruit scones with clotted cream, chocolate éclair, lemon cupcake and raspberry cream sponge). I am not a big fan of BA afternoon tea and snacks concept (especially not of the sandwiches served in a plastic container), and it was not different this time. Alternatively, instead of the sandwiches, one could also choose a mixed Mediterranean vegetable and pumpkin seed salad with olive oil and red wine vinegar dressing. # CREW: I love BA’s cabin crew, and during all my BA flights, I never encountered any problem with them or with the onboard service. I think it’s often a matter of mutual respect. The upper cabin is served by 2 flight attendants, and on this particular flight, the one steward and one stewardess were very kind and competent (not different from other flight experiences though). # BAR: British Airways 747 has a walk-up “Club Kitchen” onboard, where fliers can graze between meals. You have the option of sandwiches, fine artisan pastries, yoghurt, ice cream, fresh fruit, and/or a chocolate selection. # LAVATORY: lavatories were kept clean during the flight. They are small and not very luxurious as compared to those of other airlines. # ENTERTAINMENT: Not only is the touch screen rather small, but the selection of movies and TV shows on order is also rather limited (especially for a 10+ hour flight). Where is the Business Class walk-up “Club Kitchen” located in the BA 747? Is it in the upper or lower deck? My husband and I have gotten a great deal on BA business class flights (treat!) that are supposed to include this plane. Now to pick the best seat. Really wanting to try the upper deck, but in your video, you walk through the economy section to get to the stairs for the upper deck. Is this necessary or did you do it for the sake of the video? Part of the perk of flying business class for us is being able to quickly get on/off the plane at the airport (customs/etc. await). Also, lugging our carry-ons up the stairs doesn’t sound appealing, but if everything we need is upstairs once we’re up there (lav./night-time snacks), then shouldn’t be a problem (providing the stairs are manageable with a standard case and laptop bag). Thank you and appreciate the review. Hi there, no worries: I did this for the sake of the video. The boarding door is directly beslides the stairs to the upper deck. And yes, it’s no problem to go up the stairs with carry on luggage. Enjoy your travels and safe flights! Thanks so much for the reply. I’ve just selected our seats. Only pairs available in the upper deck were in row 63, but we’re going to give it a go.. Again, thank you for the detailed review and reply.